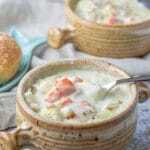 This easy clam chowder recipe is straight from New England and remains my favorite! 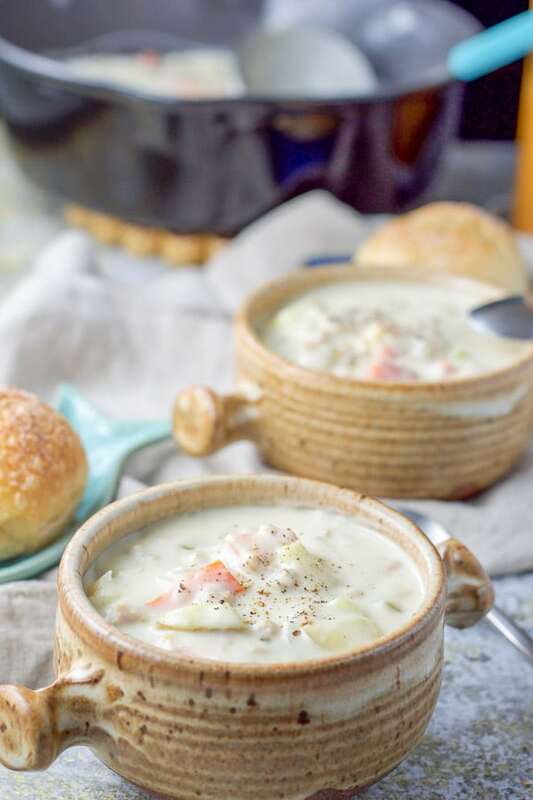 I try all different recipes for creamy clam chowder but I keep coming back to this one! Living in New England has its perks: beautiful foliage, cool accents, Maine lobsters, delish seafood and … easy clam chowder! Or as Bostonians would say, “clam chowdah”. Everyone has a favorite recipe. I love New England clam chowder. So much so, that I won’t get it in a restaurant unless I know it is good. I hate to be disappointed by a watery bowl of a tasteless chowder wannabe. When I was growing up, my parents had my three sisters and me help them make the chowder (read: do the grunt work). We would sit there cutting up the slippery quahogs and the greasy salt pork. Very labor intensive, but the final result was always delicious. I knew I had to come up with a recipe that tasted delicious but without the muss and fuss of the salt pork or quahogs. I also wanted a thicker and creamier chowder than the one I grew up with. I think I’ve nailed it with this recipe, which I’ve been making for over 20 years. Bring the vegetable mixture to a boil and lower to a simmer and cook for 15 minutes. Check with a fork to see if it is done and add 5 minutes if not. After you reach the right consistency, take the pan of vegetables cooked in the clam juice and pour the whole thing in the roux mixture. Mix it together until it is smooth. Add the drained the chopped clams and let it heat for 5 more minutes, being careful not to boil the clam chowder. You don’t want rubbery clams. Here’s what it looks like before you ladle it out to your chowder-loving tribe. Let’s see how thick this easy clam chowder really is. And the clam chowder from above. Do you see my reflection in one of the spoons. I hope you enjoy this easy clam chowder recipe as much as I do. Please feel free to leave me a comment. How do you like your chowder? Thick? Chockful of veggies? I’d love to know! 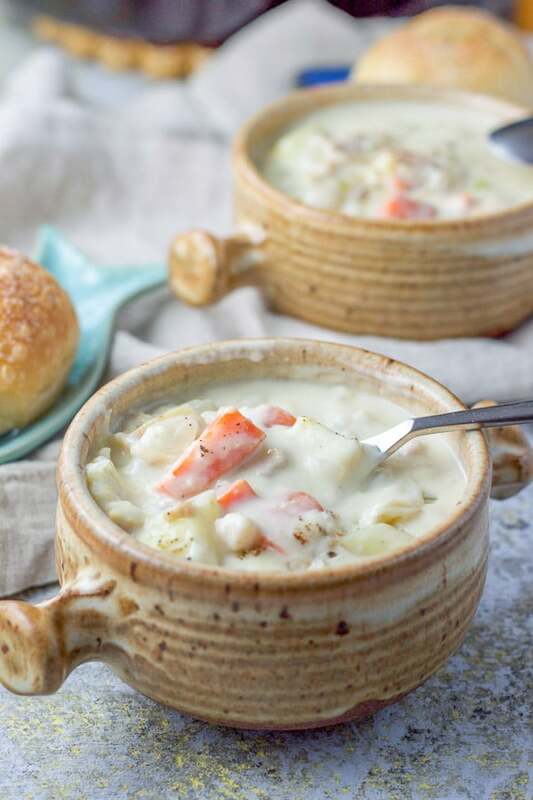 If you’ve tried this easy clam chowder or any other recipe on the blog, I’d love the hear what you thought about it in the comments below. I love hearing from you! You can also FOLLOW ME on FACEBOOK, TWITTER, INSTAGRAM and PINTEREST to see more of my delicious food and delightful cocktails! This easy clam chowder satisfies the palate while being a quick and delicious appetizer or meal! Check vegetables at 15 minutes to see if done (tender). Cook for 5 more minutes if not done. Remove from heat and set aside. Yum. I’m always on the lookout for some good clam chowder! Can’t wait to try your recipe! Thanks Joyce! I appreciate the comment! Thanks Sherri! I know peeps put bacon in their chowder. My folks put salt pork, but I haven’t for years. I’ll have to try the next time I make it! It looks so creamy! I love that you’ve come up with an easy way to cook a yummy clam chowder. I wish I lived in the Northeast and could have all the delicious seafood anytime! Thanks Pam! It is fun getting to eat such fresh seafood!! Very pretty dish! This look amazing! I definitely want to try your recipe, and I’m sure it’s very tasty. Is good food and this looks like one of the BEST! So YUMMY! Thank you Neli! It is very tasty! Yum! This clam chowder looks and sounds so delicious! I’ve never tried it, but I will definitely save this as one of the things to try! Pinned! Thanks Shanika! It’s super easy and very delicious! i was just looking at this on instagram and saying homemade soups and stews are so comforting. Thank you Jacqueline! I agree!!! 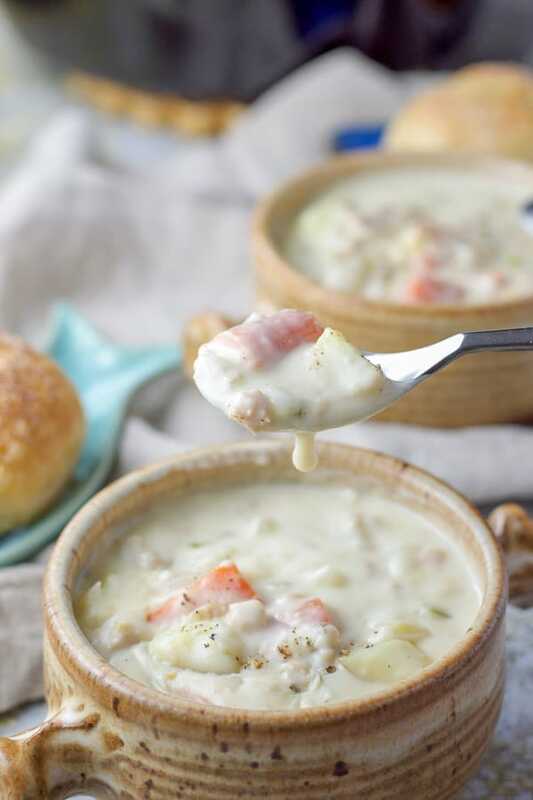 This creamy clam chowder looks fantastic! The thick and rich sauce and all the vegetables make the perfect meal all by itself. I do eat clam chowder as my meal! Thanks Sharon! This bowl of goodness is calling my name. 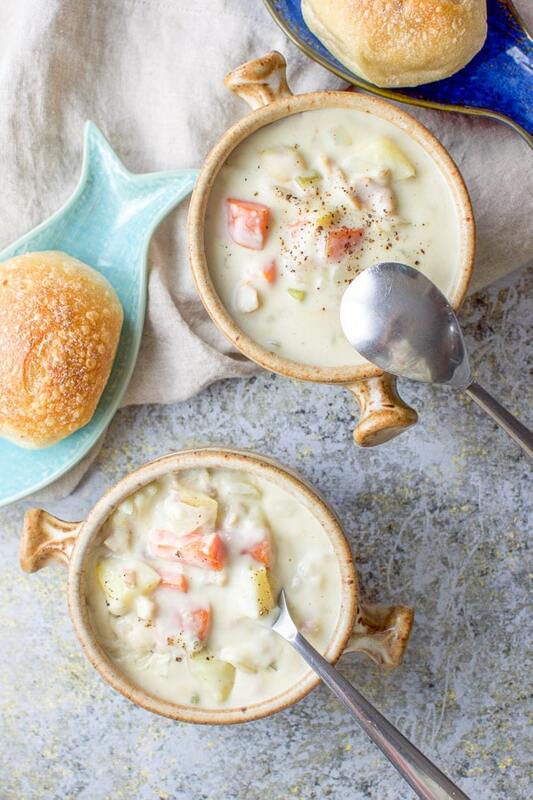 I LOVE clam chowder…and this looks so delicious. Comfort food that is great all year round works for me. Sure wish I lived closer to the sea for the fresh seafood. I do love a good clam chowdah, and I have to admit that I’ve never made it at home. If you’re telling me I can start with canned clams and have a chowder that’s every bit as good as restaurant-variety “from the shell” offerings, I am ALL IN. These shots look amazing! Living on Long Island, we love chowder too! My son worked at the local fish market in high school so I not only got great clams, he shucked for me. I make a lot of Manhatten Clam Chowder but the family prefers New England. We are all together tomorrow night, they are going to love this easy clam chowder. Easy and delish! That’s so fun Eileen! There is nothing like fresh seafood. I do like Manhattan clam chowder but I prefer NE as well! Thank you for your comment! Yum! I am so craving a bowl (or 3) of this right now. It looks incredibly creamy and tasty! My husband is from New England and is always talking about how he can’t find a good clam chowder down here ( we live in Florida).. I haven’t thought to make my own until I saw this recipe! He will be thrilled! Oh I looooove New England. My dad’s family came from the Boston area, so Clam Chowdah is huuuuge in my family. Reading this post brought back some very happy memories 🙂 I will have to share it with my family members who may want quick and easy a taste of home! A girl after my own heart. We live in Boston so clam chowder is always a must! Love how thick and creamy this recipe is, though I also love the thinner style my mom usually makes. 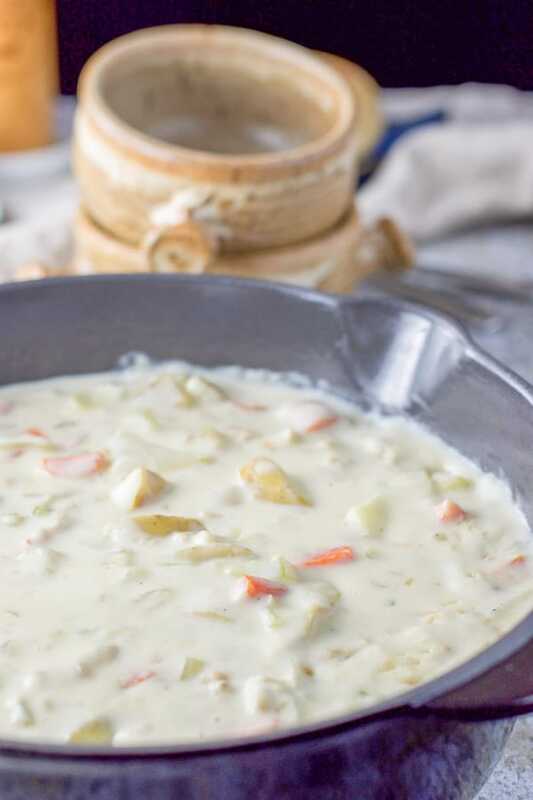 It’s never summer until chowder is on the menu! New England clam chowder is the best! I love that you’ve created an easy to make version! Thank you Kathryn! I’m all for easy!! One of your all-time best recipes! Family enjoyed it just last weekend. Go, New England! This classic is one of my all time favorites and it really looks like you nailed it. Your soup looks fantastic! The weather is supposed to be unseasonably chilly this week so it will be a perfect time to make some soup! Thanks so much Rachel. I appreciate it! Haha.. laughing at ‘do the grunt work’!! Isn’t that the truth! Joking aside, this recipe is absolutely lovely. Clam chowder can be done so poorly if you don’t know exactly what you are doing but this recipe is perfect and shows how easy it is to make perfect clam chowder. Love it! Oh this looks so creamy and so delicious Elaine. I love having a good soup or stew no matter what season so I’ll be try this for sure very soon. It’s perfect family dinner. Me too Natalie!! Thank you! Can you believe I’ve never even tried clam chowder, let alone made it myself! You make it seem do-able, however, which is pretty tempting – I could whip up a batch for dinner one night ASAP! Monica, you simply have to! It’s so delicious! Thanks for your comment! This sounds gorgeous and one of my favorites! It’s perfect anytime, love it!